It’s fall in Chicago (which probably means it was 80 degrees two days ago, but now you’ve got to bust out the puffy coats). 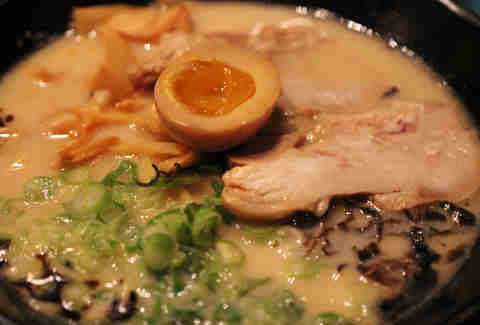 If it is a puffy coat day, there’s nothing better to warm your heart, soul, and belly than a steaming bowl of ramen. As with all cuisine, Chicago has a boat load of options to choose from. But you definitely don’t want to end up ordering a bad bowl of ramen -- soon the sun will be a stranger, and none of us need another reason to be sad. So, follow this list to be sure you get the good stuff. Ajida is certainly a great lunchtime option for Loop workers or out-of-towners, but be sure to hit up this spot during its happy hour, every day from 3pm to close. 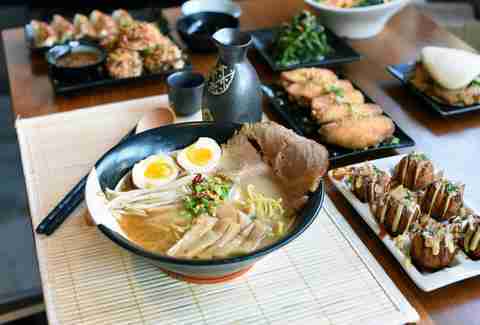 This will get you awesome prices on combos with a ton of food, including appetizers, skewers, and ramen bowls, plus beer and sake. Furious Spoon has been taking over Chicago at lightning speed. The chain is hard to miss, with its graffiti and pounding hip-hop bursting out the door of every location. 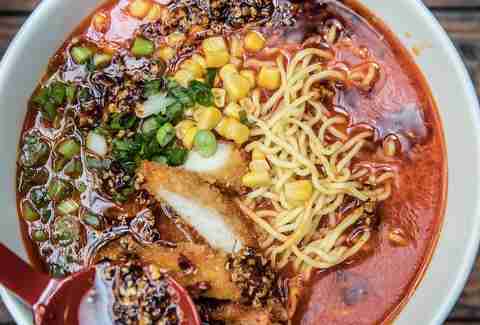 The ramen snobs of Chicago will insist this isn’t where you can get the best bowl, but the food is good, and the vibe is fun and worth checking out if you’re young and cool (or trying to be). Yes, the ramen is excellent, but the general consensus in Chicago is that the Japanese curry is where it’s at here at this casual spot. You should probably try both just to be safe, and be sure to bring your own booze for maximum enjoyment. Check if they’re open before you head out -- their hours are a little inconsistent. If you’re looking for an authentic Japanese experience, this is a great spot for you. An izakaya is a type of Japanese bar that usually features small dishes to accompany drinks. Izakaya Mita is a great place to bring the family or to hang out with friends after work. It has the same comfy feel of a Chicago neighborhood bar -- and the ramen makes it even more cozy. 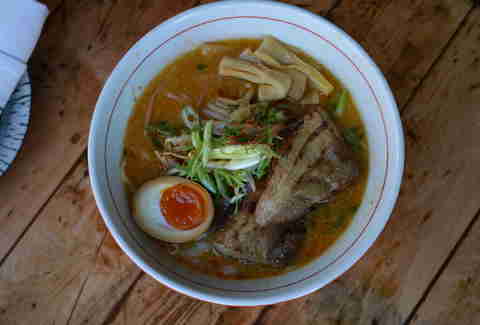 You have got to try the pork belly ramen here. It’s thick and tender and comes as part of a gigantic serving. The vegetable ramen is also some of the best in the city, and if you’re looking to branch out to other dishes, this place has some great bibimbop, too. It’s a small, casual spot with fast and friendly service, perfect for a quick lunch or a get-together with a few friends. If you’re going to Kizuki, the Tonkotsu Shoyu Ramen (pork broth flavored with Yamaguchi soy sauce and topped with black garlic oil) is a good place to start. The food here is prepared by roasting bones before boiling -- resulting in a rich, deeply flavorful broth. This is a trendy spot with a bar ideal for almost any occasion, from a first date to a family outing to a solo lunch. Oiistar puts a lovely twist on traditional ramen noodles by weaving in French and Italian influences, taking the comfort food theme to another level. In addition to five delectable ramen dishes, enjoy a variety of appetizers from bruschetta to pan-seared portobello mushrooms. You also cannot skip the creme brulee with espresso caviar at this sleek, modern lunch and dinner spot. 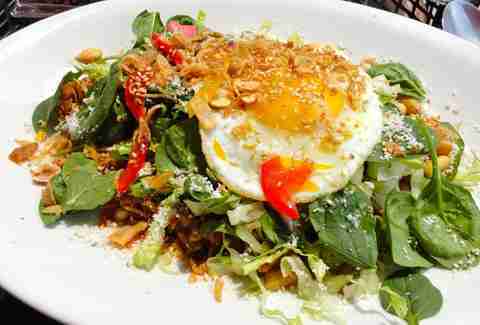 In the upscale River North neighborhood, this casual, unassuming restaurant can be easy to miss -- but that would be a mistake. 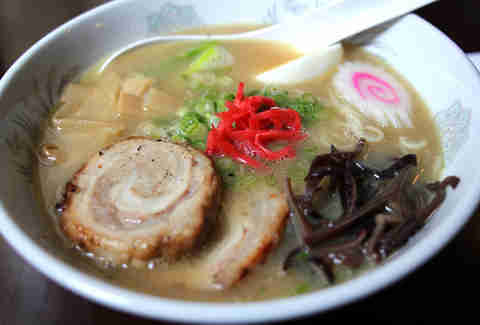 Ramen Misoya offers heaping bowls of ramen at reasonable prices. It’s a small spot, but you likely won’t have trouble finding seating for lunch or dinner. 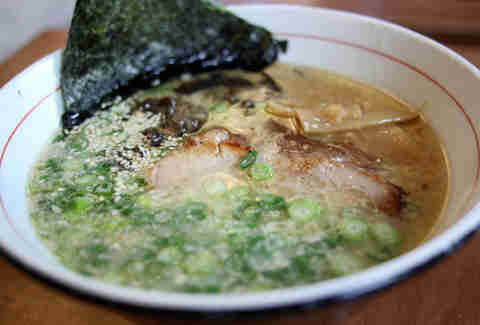 Ramen-San strikes the perfect balance between trendy but casual. It would be a great place for a first date, but swinging in for a solo lunch shouldn’t be out of the question. 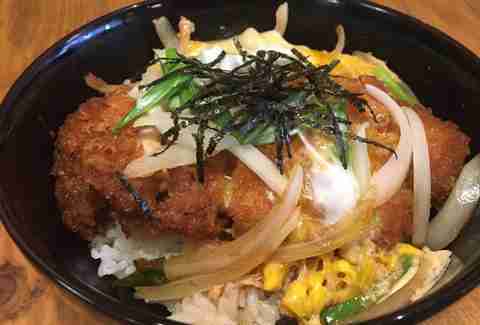 In fact, their $15 Express Lunch is a must-try. Pick a rice plate, main dish, and beverage, and enjoy. This is also a great spot for grabbing a drink or sharing some apps like chicken wings, dumplings, buns, and more. 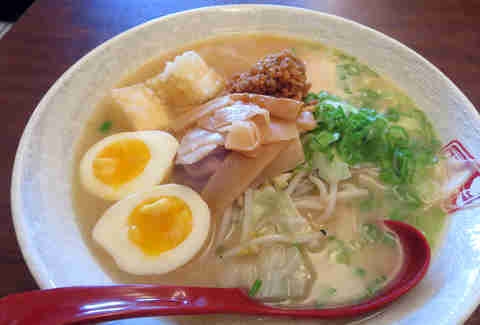 Ramen Takeya, sister restaurant of Wasabi in Logan Square (also on this list), specializes in chicken paitan ramen, featuring a lighter broth than you might find at other ramen spots. The restaurant is designed to look like Tokyo alleys, and the real treat is sitting at the bar for a perfect view of the kitchen, where all the steamy ramen magic happens. 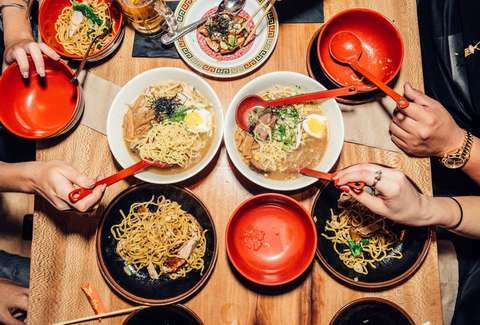 Cozy up in a booth or grab a seat at a community table at this self-proclaimed “original River North ramen shop.” The ramen is delicious, of course, and this might be one of the only ramen spots that features a brunch menu. Definitely try the Hangover Ramen, featuring tan tan and tonkotsu broth with spicy pork miso paste, molten egg, bok choy, kimchi, bean sprouts, fried pork belly, and duck fat fried chicken. Strings is one of Chicago’s most popular ramen restaurants because of the high-quality food, but it’s also great for any beginners out there. 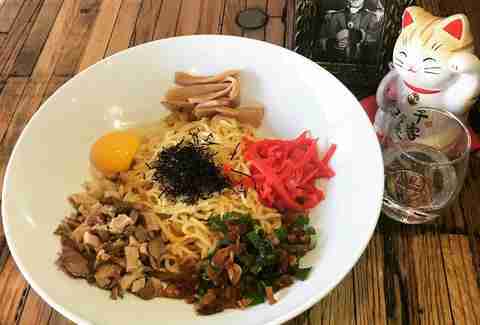 The menu features a fun map of Japan with key ramen points, ramen history, ramen terminology explained, as well as some pro tips on how to optimize your ramen-eating experience. 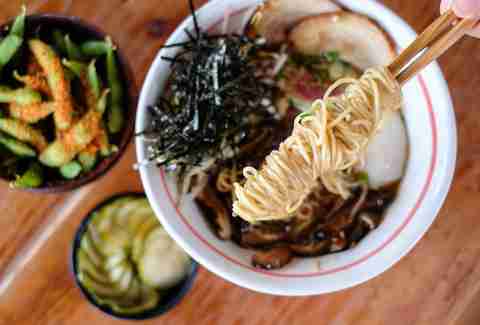 Urbanbelly might be another good spot for beginners -- there’s only one ramen item on the menu. But it’s delicious, and if you decide you’d rather have pho or another steamy bowl once you get there, you have that option! Urbanbelly fuses Asian and American food and feels like a cozy neighborhood hangout, but with better food. Wasabi is a Japanese-owned restaurant that offers both traditional and contemporary Japanese dishes. 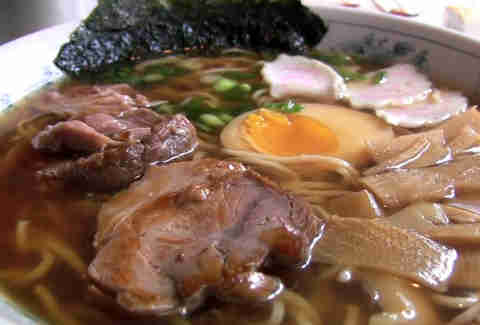 The ramen is made from boiling pork bones for days (yes, days! 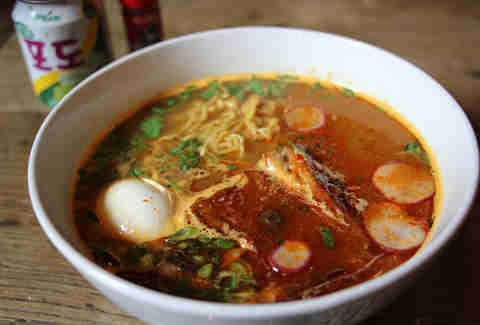 ), and it shows in the unreal flavor bursting from the many ramen options. Hit up this sleek spot in hip Logan Square, and be sure to try the pork belly and kimchi spring rolls while you’re at it. Jessica Cabe is a contributor to Thrillist.